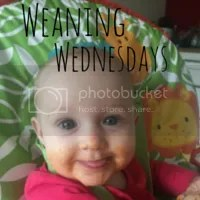 Weaning is funny and messy! Brilliant! Very cute – it is funny and messy for sure. Even my toddler falls asleep eating sometimes, which is very funy bless him. Bless her! There is a photo of J on my last post where he is asleep mid-dinner, clinging on to a green bean!